A while ago I ran around my neighbourhood in a frantic search for a can of kidney beans as I was developing a Chilli Pancake Stack and had run out of this store cupboard staple! Of the 6 neighbours who were in on our close (the other’s were probably diving for cover behind their sofas), not one had a can of said beans! They are always good for eggs (which I do replace) but this was obviously a step too far! So recently I found myself yet again without kidney beans and gave my family the option of adding baked beans or chickpeas to my Chilli instead. The answer came back that I should add the baked beans. Hence we are now baked bean converts as they give an extra layer of depth and a slight sweetness to a Chilli. 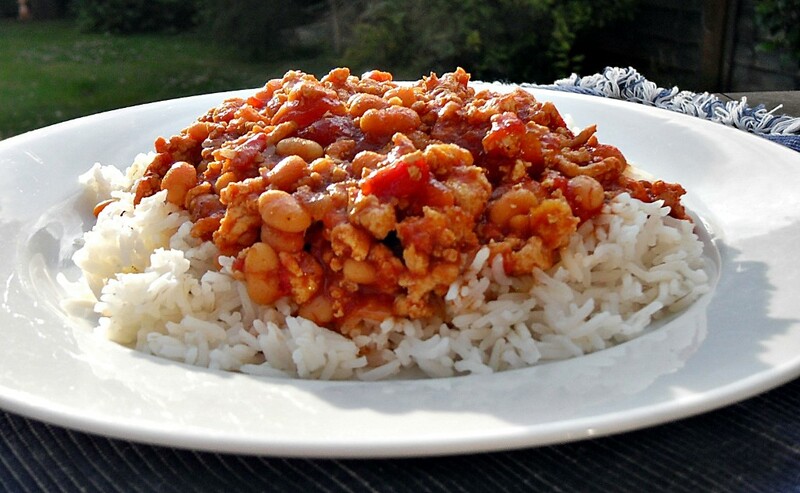 This Turkey Chilli with Baked Beans has evolved with tweaks each time I’ve made it and now it’s time share it with you as it’s so tasty and delicious and you won’t wish it was made with beef either! We all need to cut down on our red meat consumption so this dish is great as there is no compromise on flavour and minced turkey breast is virtually fat free unlike minced beef! If you’re one for reaching out for a jar of chilli sauce in the supermarket then I urge you to make this instead. Not only is it cheaper to make but far tastier! The value bake beans and chopped tomatoes I use come to about 50p and the rest of the ingredients come in well under 50p too. So as a jar of chilli sauce costs around £2 and then you have to add your own beans on top of that, it’s a really good saving and doesn’t take much longer to prepare! We like our Chilli with a bit of a kick but if you’re making it for young children you may want to reduce the amount of chilli powder in this recipe. I have weaned my daughter onto chilli gradually over the years by letting her eat chilli dishes when they had gone almost cold to lessen the heat which has really worked well. She’s not at the stage of eating Jalapenos just yet but I’m sure that will come! I do hope you try my Turkey Chilli and hopefully everyone has a can of baked beans in their cupboard unlike kidney beans which seem to be a rarity – or is that just in my neighbourhood?! 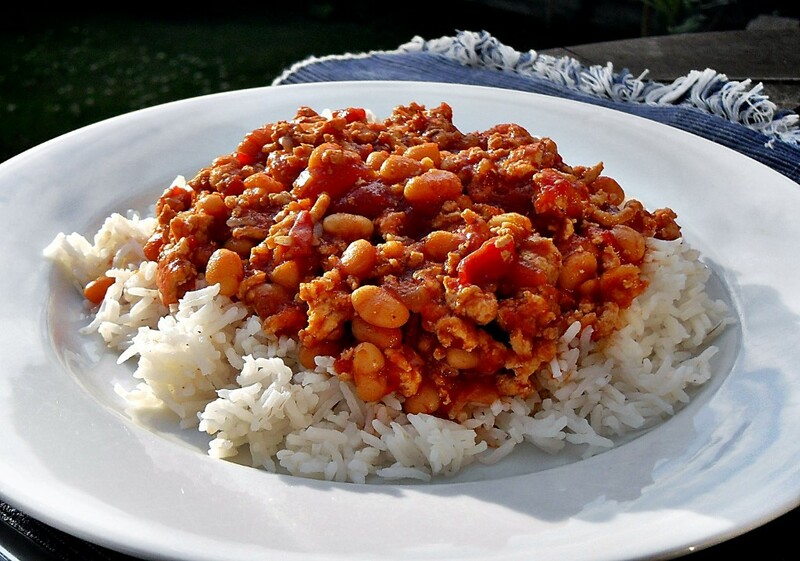 A fabulously tasty chilli made with turkey breast mince and baked beans - so delicious and healthy! Heat 1 tbsp of oil in a large pan on a gentle heat and sweat the onions until soft. Add another tbsp of oil and then turn up the heat to fry turkey mince until cooked. Then add another tbsp of oil plus the garlic, spices, herbs and seasoning and cook for a minute before adding the chopped tomatoes, baked beans and water. Bring to the boil then cover and simmer for 30 minutes. For more chilli and minced turkey inspiration check out Danni’s Sundried Tomato Turkey Meatballs in a Roasted Red Pepper Sauce, Jeanne’s Chilli con Carne with Cornbread Topping, Sarah’s Polenta Crust Turkey Burgers with Heirloom Tomato Salsa, Kellie’s Very Veggie Black Bean Chilli with Southern Cornbread, Helen’s Leftover Turkey Coleslaw with Tahini and Cranberry Dressing, Sally’s Hot Peri Peri Sauce, Mozambique Style or Jen’s Chilli & Sesame Rolls. 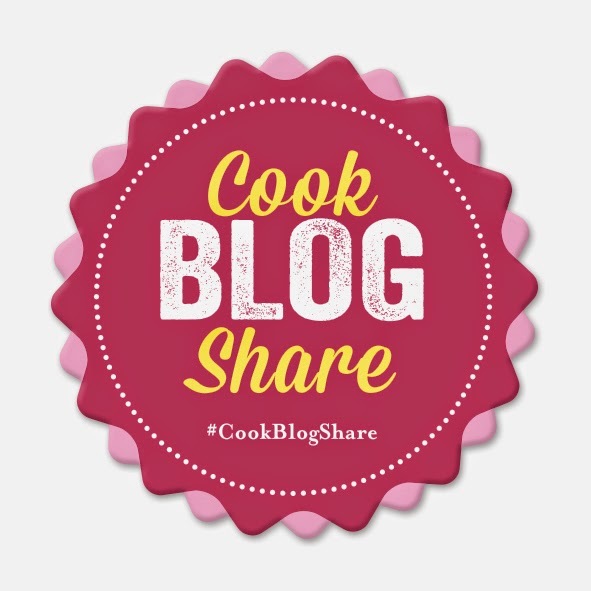 I’m entering my Turkey Chilli with Baked Beans into a few blogging events: Tasty Tuesday’s over at Honest Mum, Recipe of the Week from A Mummy Too and Cook Blog Share over at Supergolden Bakes. Made this last night, everyone loved it. A healthier kind of chilli. What a great idea I would never have thought of this but it makes sense and the kids would enjoy it. Never used turkey mince before, healthier than beef. love these types of recipes – not too much meat. Don’t get me wrong, I’m not a veggie but sometimes like to have meals with less meat than usual. This seems ideal for our palate. I learned the trick with baked beans when my boys were younger.. neither liked kidneys beans but both liked chilli. This recipe makes me hungry and I’ve not long eaten!